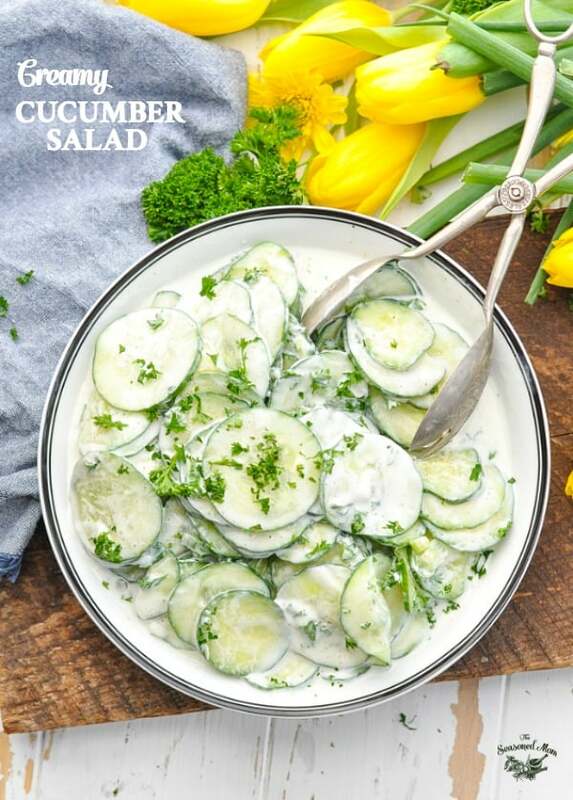 This light, fresh, and healthy Creamy Cucumber Salad is an easy side dish recipe that pairs perfectly with just about any summer meal! 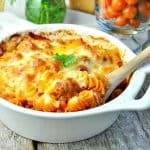 Best of all, it's ready in just 10 minutes, and you probably already have all of the ingredients that you need! 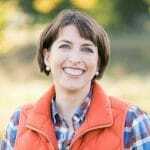 I’ve got a pretty picky 4-year-old at home, which means that there are only a handful of fruits and vegetables that I can serve at any given meal that I know will automatically be consumed. Since cucumbers are at the top of that list, I’m always looking for new and different ways to prepare the veggie. 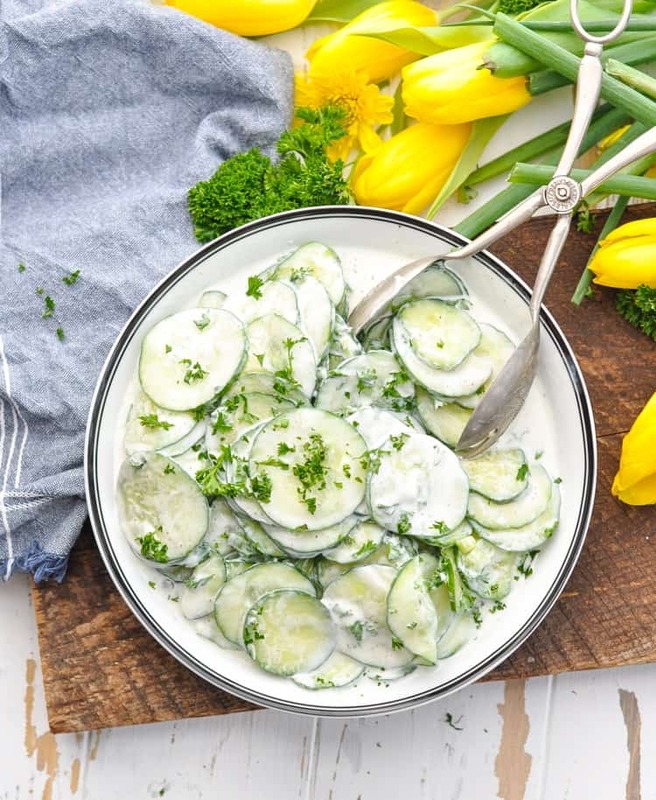 This Creamy Cucumber Salad is my new favorite side dish because it’s easy, it’s healthy, and it’s full of flavor! How do you make a Creamy Cucumber Salad? 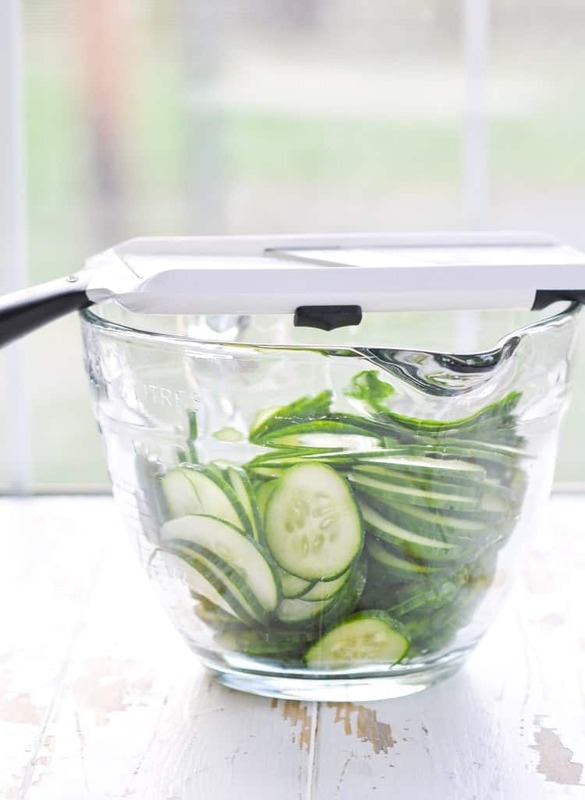 My favorite tool for quick-prep veggies is the mandoline slicer. Are you familiar with a mandoline? If not, be warned: these tools are SHARP, and you don’t want to get your fingertips anywhere near the blades (trust me…). The cucumbers are tossed with green onions and fresh herbs, and then it’s time to whisk together your creamy dressing. Pro tip: use kitchen shears to snip the herbs and green onions right into the bowl. Again…we’re avoiding dirty knives and cutting boards! 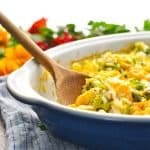 Depending on your preference, you can use either plain Greek-style yogurt as the base for your dressing, or you can go with sour cream (or a combo?). You do you! 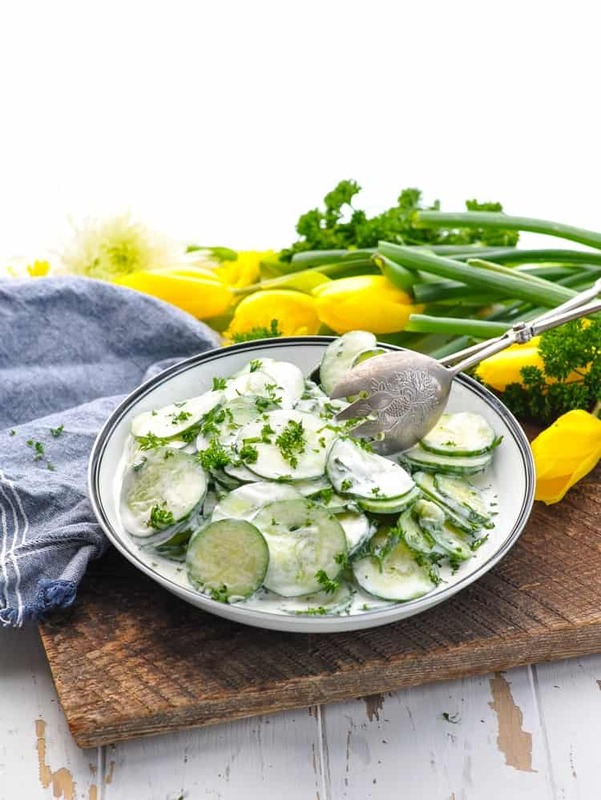 The addition of the onions, herbs, and creamy dressing transforms a bland, watery cucumber into a crisp, flavorful salad! It’s so fresh, so simple, and so perfect for summer. The cucumber salad just balances out your plate and complements a burger, a piece of grilled chicken, or a nice piece of fish. 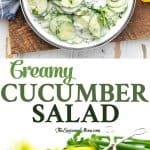 Can I prepare a Creamy Cucumber Salad in advance? Yes! Kind of. Personally, I prefer the salad about 1 hour after it has been prepared. 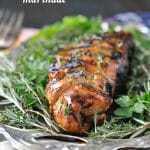 That gives the cucumbers enough time to “marinate” in the dressing without becoming soggy. That said, I have certainly devoured the leftovers on Day 2 and Day 3 without complaint! 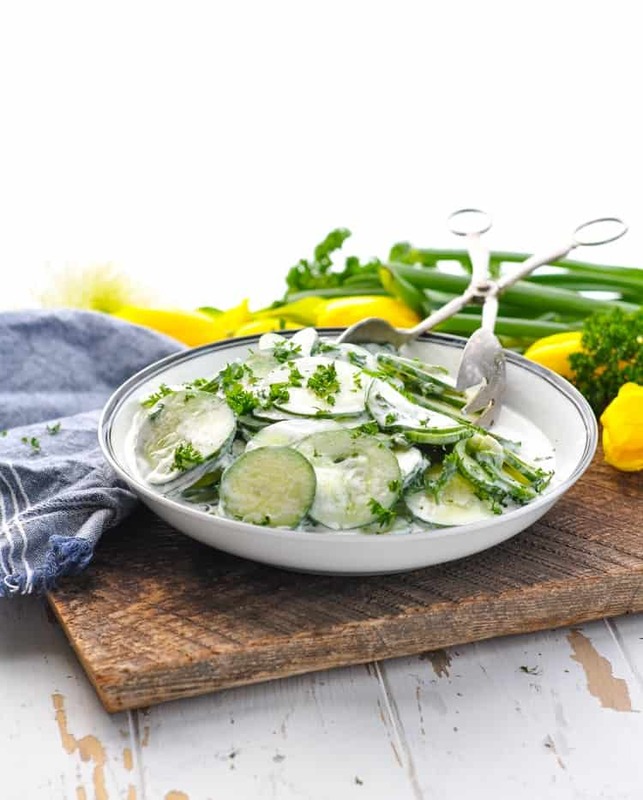 It’s not bad, it’s just that the cucumbers release liquid as they sit in the bowl, so your creamy dressing will become a bit watery and you will probably want to drain some of it off. The cucumbers also lose their “crispiness” as they sit. Place the cucumbers, green onions, and parsley in your serving bowl. Cover with a damp paper towel and store in the refrigerator. 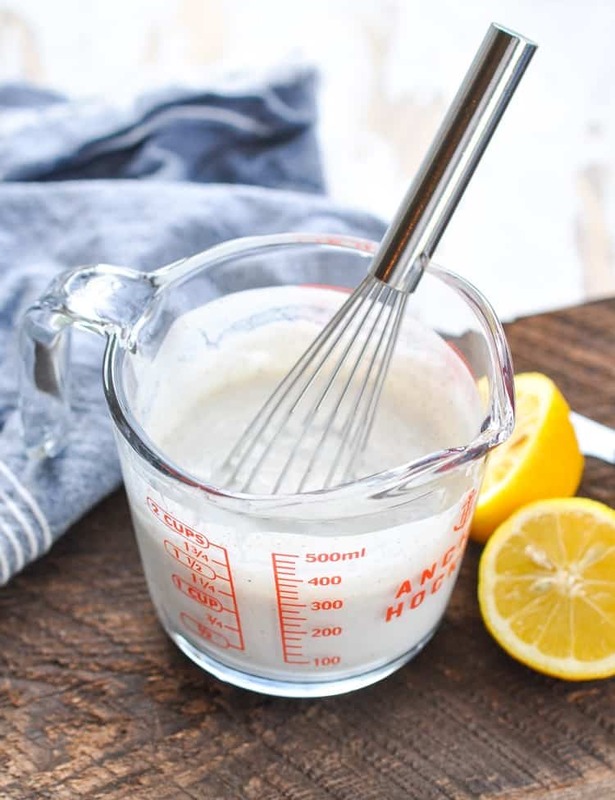 Whisk together your creamy dressing and keep it covered in a separate bowl or jar in the refrigerator. Shortly before serving, pour the dressing over the cucumber mixture and garnish with additional fresh herbs. Ta-da! Problem solved. 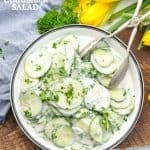 The perfect Creamy Cucumber Salad! Place cucumbers, parsley, and green onions in a serving bowl. 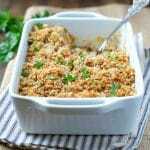 In a separate bowl, whisk together yogurt or sour cream, sugar, celery salt, pepper, vinegar, and lemon juice until smooth. Pour dressing over the cucumber mixture and toss to coat. Season with salt and pepper, to taste. Garnish with additional parsley, if desired. *If you use regular cucumbers instead of the English cucumbers, you will want to peel them because regular cucumbers tend to have a tougher, waxier exterior. Cooking Just for Two? 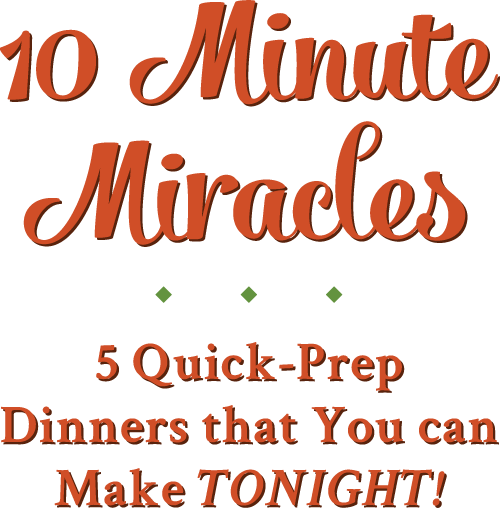 You can cut all of the ingredients in half and prepare a smaller salad. The rest of the instructions remain the same. Previous Post: « Dump-and-Bake Chicken Pesto Pasta + a Video!